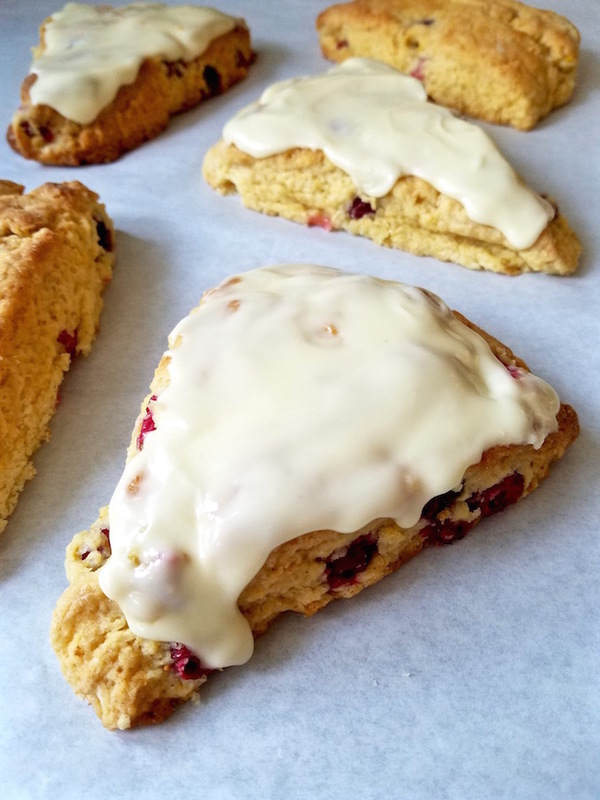 Cranberry Orange Scones are flavorful, slightly crunchy on the outside, have a moist interior, and are perfect for the holiday season. 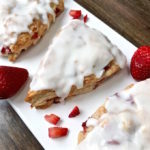 The cranberry and orange combination mixed with a cream based dough makes a perfect yet simple breakfast or anytime treat. 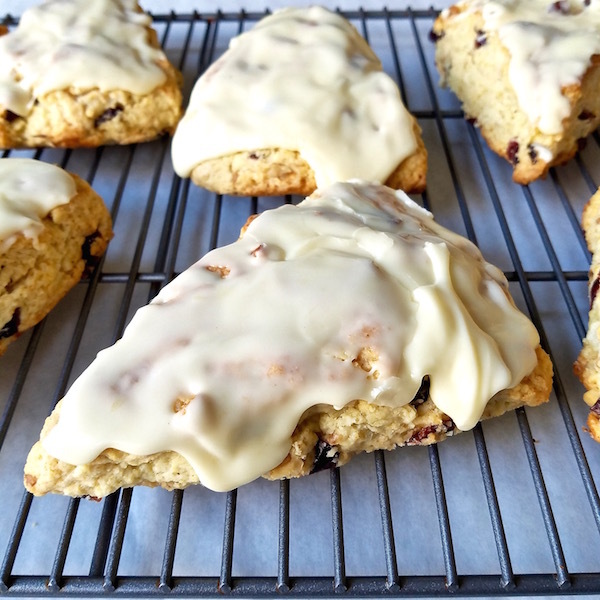 Cranberry orange scones take 10 minutes or less to prep and about 20 minutes to bake. While they are cooling you can make a creamy orange glaze for the topping or use a simple sprinkle of sugar for a crunchy topping. Voila! You have yourself a delicious scone. The first time I ate a scone was when I was pregnant with my first child. I don’t think I even knew what a scone was but I wanted one asap. I must have seen it in the bakery case while I was ordering my decaf whatever. Since then, scones have been one of my favorite breakfast treats. Thing is, a lot of them aren’t good. Sometimes they are too dry, have no flavor, and one time I had one that wasn’t fully cooked. No way, no more. I now make my own and the texture is spot on. 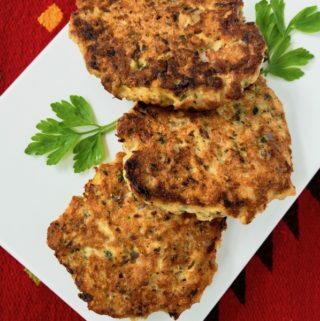 Plus, they are ridiculously easy to make. Combine the flour, sugar, baking powder, salt, and zest. 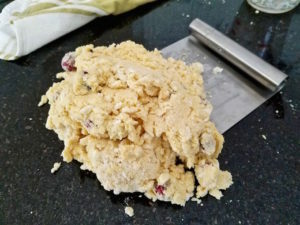 Add butter and mix using a fork, your fingers, or a pastry cutter until butter is mostly incorporated with flour. Add the cranberries and toss to combine. You can use a heaping cup of fresh cranberries or dried cranberries. Measure the heavy cream and mix with orange juice concentrate. Pour into flour mixture and mix until you have a shaggy wet dough. Turn onto a floured counter and gather into a ball. Flatten into a 1 inch thick round. Using a scraper (affiliate link) or sharp knife, slice into 8 wedges. Transfer onto lined baking sheet about an inch apart. Use a scraper to lift them off. 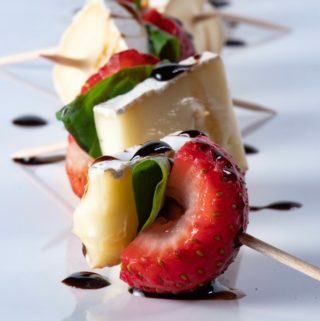 Finish either by brushing the tops with cream mixed with orange juice concentrate, then sprinkling with sugar. Raw or coarse sugar is best. Or, you can make an orange glaze that can be spooned on top after the scones have slightly cooled. You may be wondering why I use frozen orange juice concentrate instead of regular orange juice? I keep a can of frozen orange juice in my freezer at all times. I find orange juice concentrate is exactly what the name states – concentrated orange flavor. Fresh cranberries have an explosion of flavor and dried cranberries offer a chewy bite. I use less butter and more cream. Using a scraper makes it easier to manipulate and transfer the dough without using additional flour. If the dough is dry and crumbly, your scones will be too. If you find the dough too wet for you to handle, sprinkle a little flour on your counter. Use as little as possible. 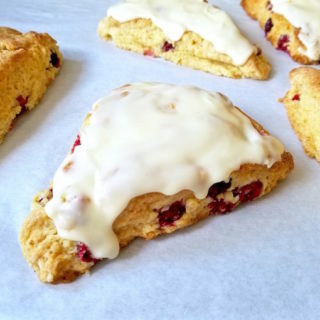 Make these cranberry orange scones for breakfast or enjoy them as a special treat. 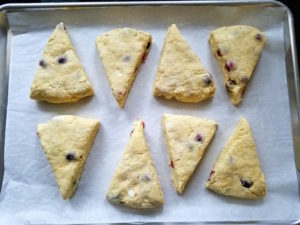 Cranberry Orange Scones are flavorful, slightly crunchy on the outside, have a moist interior, and are perfect for the holiday season. 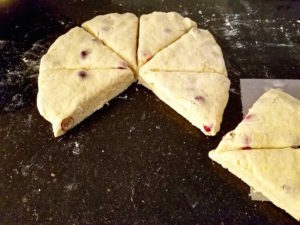 The cranberry and orange combination mixed with a cream based dough makes a perfect yet simple breakfast or anytime treat. 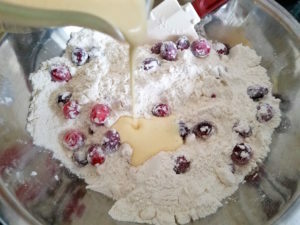 Use fresh or dried cranberries. Using orange juice concentrate intensifies the orange flavor. 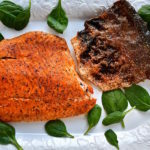 Can top with an orange glaze or top simply with raw or coarse sugar for crunch. Whisk together the flour, sugar, baking powder, salt, and zest. Add butter and using a fork, pastry cutter, or your fingers, mix until butter is mostly incorporated. Toss in the cranberries. Combine the heavy cream and frozen orange juice then add to the flour mixture. Stir until just combined. You will have a shaggy, wet dough. Sprinkle the counter with a little flour. Turn out the dough onto floured counter, flip to coat the other side with a little flour. Use a scraper to do this. Pat down into 1" thick round, then cut into 8 wedges. Place the wedges on a parchment lined baking sheet. 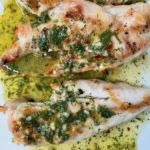 Transfer onto parchment lined baking sheet and bake for 20 - 25 minutes. See variations below if you are going for a crunchy topping. Make a glaze by combining confectioners' sugar and salt with orange juice and cream. Whisk until smooth. Add a little more cream or milk to thin, if desired. Spoon and drizzle over cooled scones to cover tops. If you rather a crunchy top instead of the glaze, mix orange juice concentrate and cream and brush a little on top of the scones before baking. Sprinkle with some sugar. Raw works wonderfully. If you want to add walnuts for a nice crunch, chop ½ cup walnuts and toss in with the cranberries. Using frozen orange juice concentrate adds orange flavor. If you have an orange or clementine, add zest. 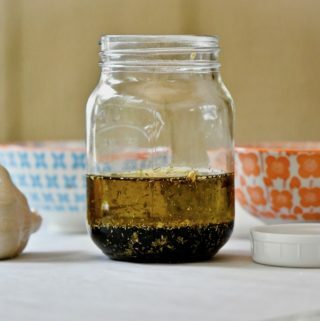 You can use the juice from the zested orange instead of the concentrate for the glaze.